The scene would be surreal if it weren’t so familiar. A man sits before a table. He is in the desert, though he is oblivious to this fact; he sits in air-conditioned comfort in a building designed to evoke the city of Venice, Italy. Above him is a chandelier the size of a compact car. A vodka tonic is in his left hand; it was given to him, free of charge, by a leggy blonde in a revealing outfit. On the table before him, playing cards are placed face-up. 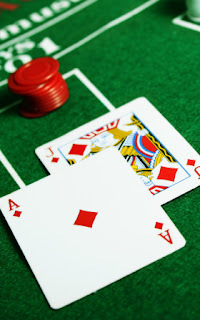 If the man’s cards meet one set of conditions and the dealer’s meet another, the man wins a small amount of money. You’ve probably guessed that the scene is a blackjack table in Las Vegas. I’ve just returned from another visit to that desert oasis, where I saw, with my own eyes, a woman praying at a roulette table. This scene (and thousands of others like it) plays out in Vegas every day. And that should teach us something about the benefits we provide via our brands. What Brand Benefits Do We Really Provide? We humans are, ultimately, rather irrational beasts. But brand stewards often choose to appeal only to the rational brain. They seek to persuade via logic, ignoring the potentially richer veins of emotions and experiences. Business-to-business firms are particularly guilty of this. I’ve spoken with several B2B marketers who lament the seemingly short list of benefits that they – and their competitors – provide: Increased sales, reduced costs, better productivity. And that’s about it. Functional. These benefits serve a practical or rational need. I’ve no idea what functional need Vegas serves, which speaks to the power of the next two kinds of benefits. Emotional. These benefits are psychological in nature. My penchant for bouts of escapism is as high as the next guy’s, and Vegas was built on exactly that need. Self-expressive. These benefits are about how we want others to see us. If I win a daily poker tournament while in Vegas, you can be sure my friends will hear about it. A strong brand can deliver all three. An Apple computer user might derive the functional benefit of an efficient operating system, the emotional benefit of creativity, and the self-expressive benefit of being seen as a progressive techie. Clearly, such a user’s brand loyalty will be well above average. You, today: What benefits are you currently the best in your category at providing? If none, what can you do differently? Consumers: Do consumers need the benefits that you’re best at? If not, what can you do differently? The other guys: What benefits are your competitors best at providing? Where is the whitespace where you can play and win? Values: What is the higher-order calling of your brand – the need that you’re truly driven to serve? The horizon: What benefits will emerge as important in the future? How can you get there first (and best)? I’m not advising you to avoid functional benefits. Quite the contrary: Functional may be the strongest card for you to play. But exploring the full range of current and future benefits is one path to winning a brand jackpot. A version of this post appeared in the Business Courier of Cincinnati column “That Branding Thing” on November 14, 2008.